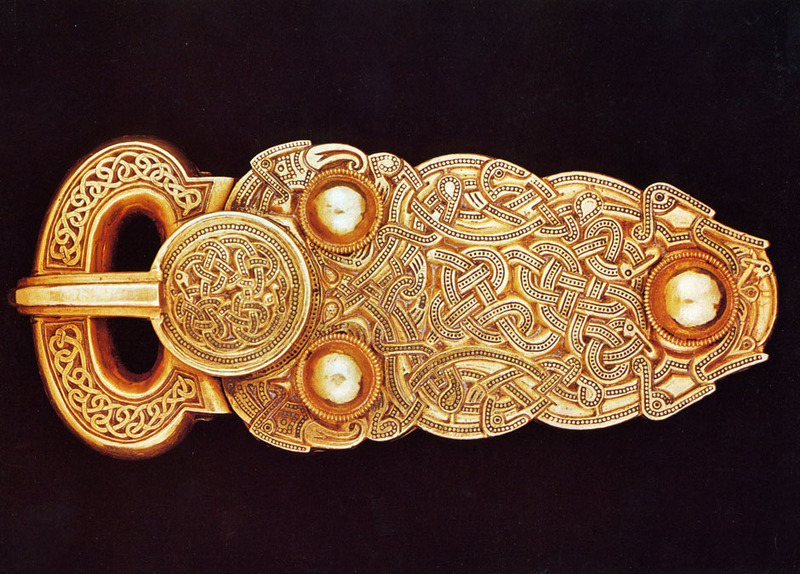 Tara Brooch, 8th c. A.D. Purse lid from the Sutton Hoo Ship Burial, gold with cloisonné enamel, 7th c. A.D.
Gold Belt Buckle, from the Sutton Hoo Ship Burial, 7th c. A.D. 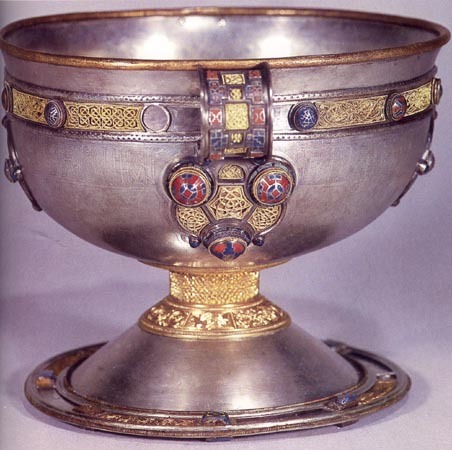 The Ardgagh Chalice, 8th c. Detail of the Ardagh Chalice. 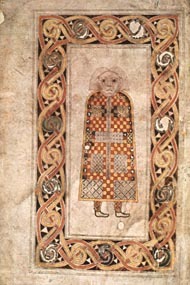 Symbol of St. Matthew from the Book of Durrow, 2nd half of the 7th c. A.D. 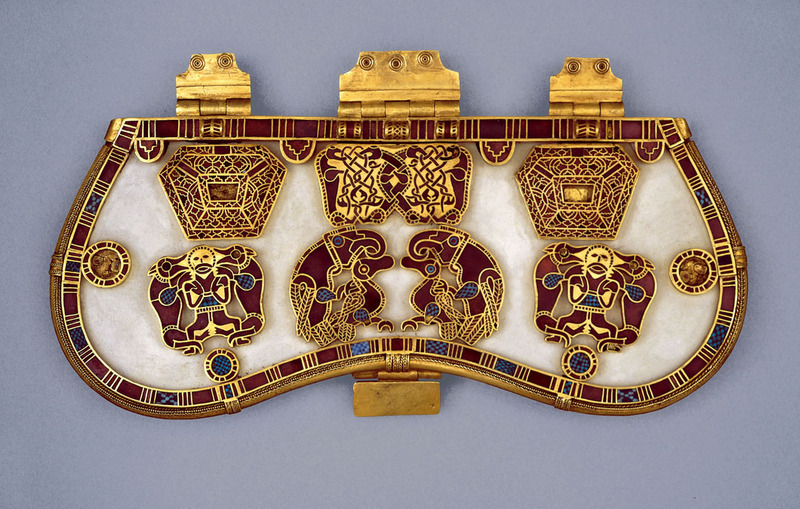 Shoulder Clasp from the Sutton Hoo Ship Burial, gold with cloisonné enamel, 7th c. A.D. 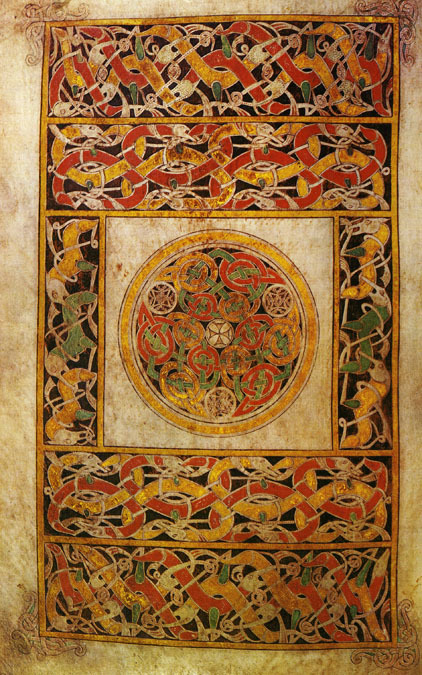 Carpet page from the Book of Durrow. 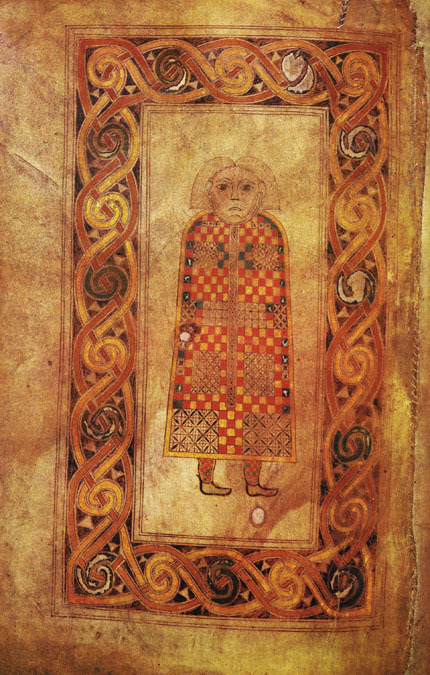 Prophet Ezra, from the Codex Amiatinus, early 8th c. St. Matthew from the Lindisfarne Gospels, late 7th c.
Incipit of Matthew I, 18 (Chi-Rho page), Book of Kells, c. 760-820. 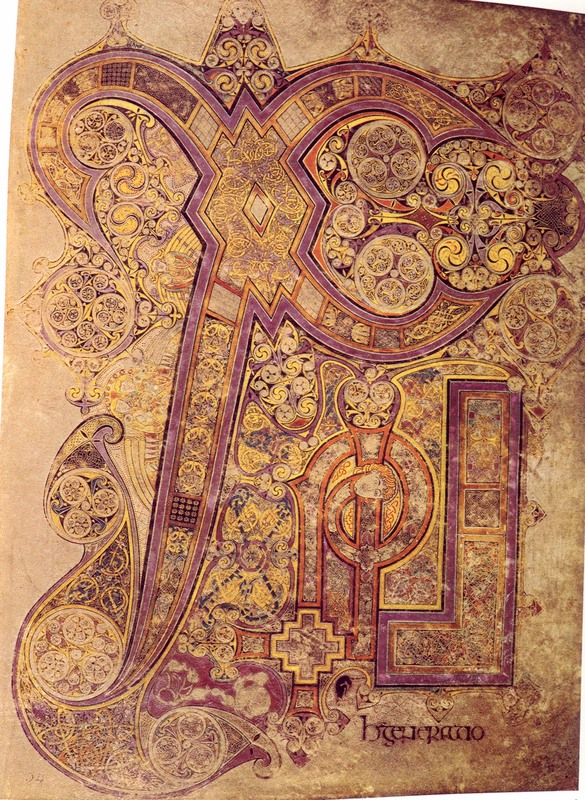 (large format image) Details of the Chi-Rho page from the Book of Kells. 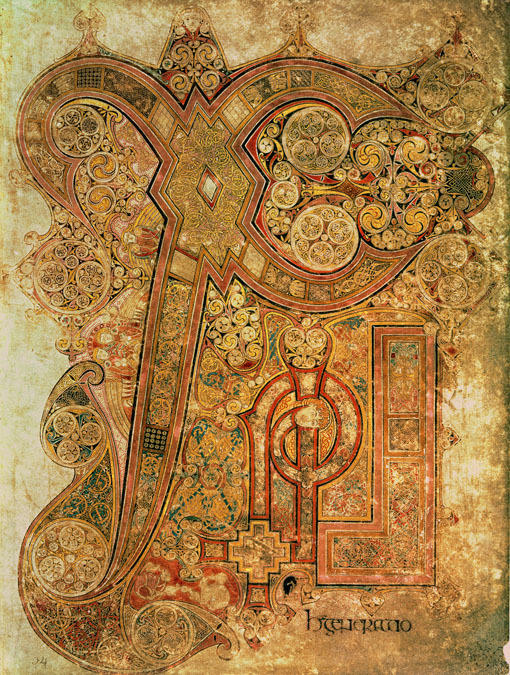 Eagle, symbol of St. John, Book of Kells. 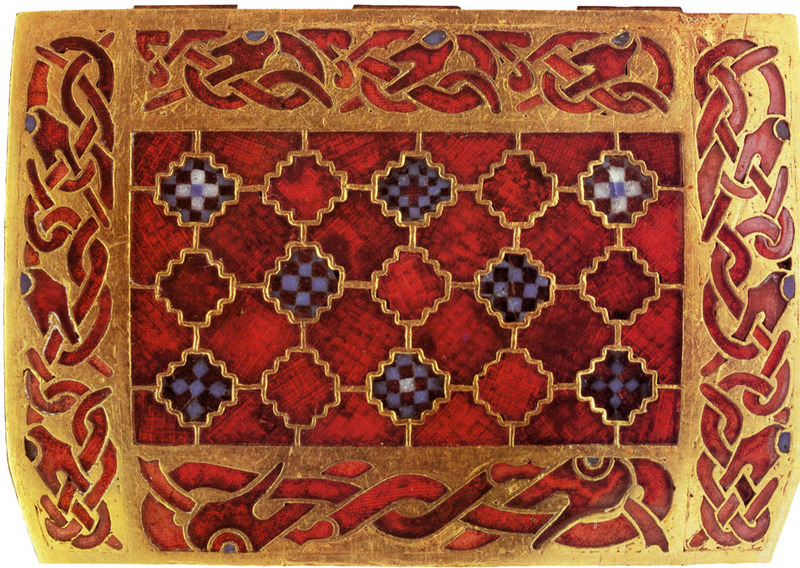 Sutton Hoo Purse Lid, 7th c.
For more on Hiberno Saxon art consult the webpages that I have constructed for my Survey of Medieval Art. 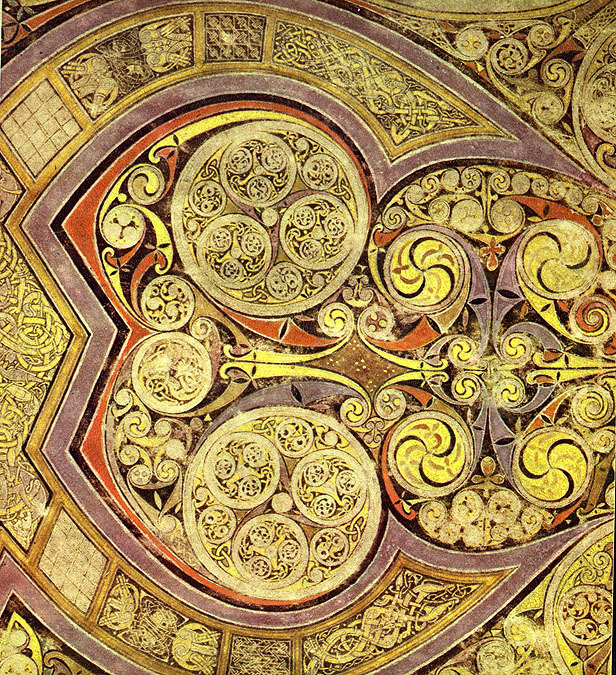 There are pages dedicated to the Sutton Hoo Ship Burial , a general discussion of Hiberno Saxon art, and a separate page dedicated to an examination of the Chi-Rho page from the Book of Kells. Insular: pertaining to the British Isles (England, Scotland, and Ireland). 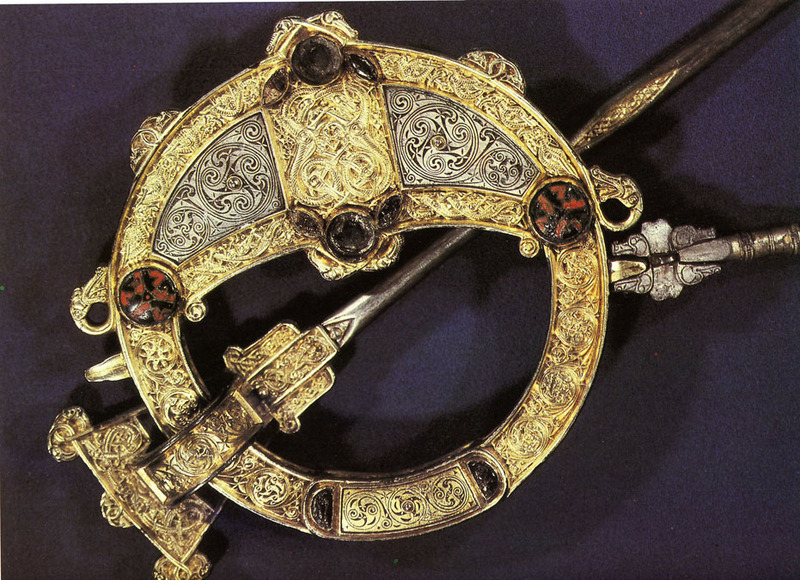 The term insular is used to encompass the cultures of the various indigenous peoples (Celts, Angles, Saxons, etc.) that inhabited the British Isles in the early middle ages. 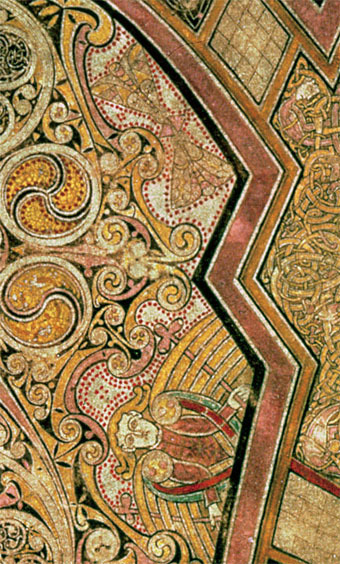 The decorative vocabulary of Insular art can be broken down into three distinct types: rectilinear, curvilinear, and interlace. Within rectilinear ornament there are check, step, and diagonal fret patterns. Curvilinear ornament comprises circles, spirals, whirls, and trumpet patterns. Interlace is composed of entangled strings or snakes. 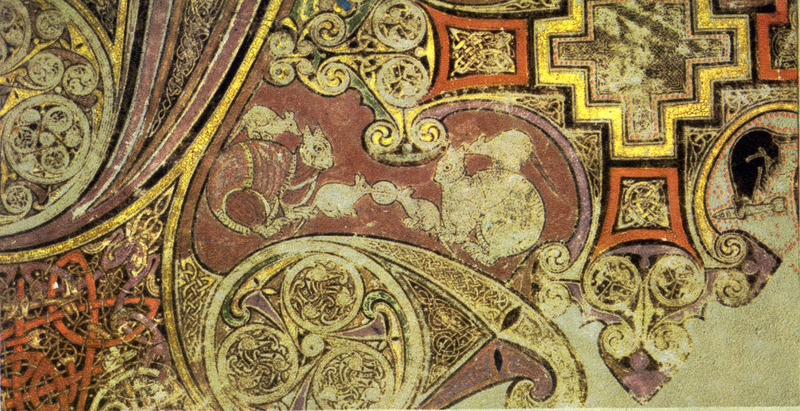 A variant of interlace is zoomorphic interlace which is composed of entangled animal forms. Cloisonné enamels: in making cloisonné enamels the surface to be decorated is divided into compartments with strips of metal (cloisons); the compartments are then filled with enamel (glass in either powder or paste form) and the whole piece is fired in a kiln. Illuminated manuscripts: a hand-written book with decoration and/ or illustrations. 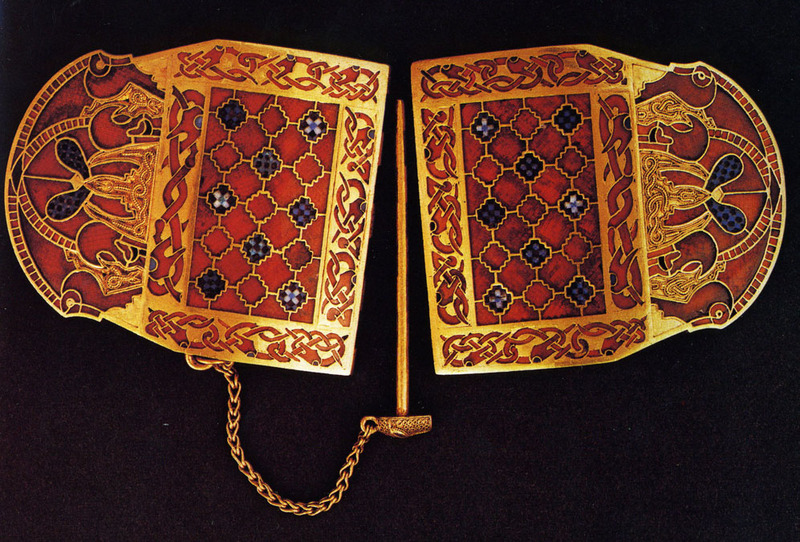 Note that the vast majority of these books are written on parchment or animal skins. Gospels: the story of the life of Christ as told in the first four books of the New Testament. The authors (Matthew, Mark, Luke, and John) are called the Evangelists. Evangelist symbols: each of the four authors of the Gospels have a symbol traditionally associated with them: Matthew-winged man; Mark-lion; Luke-ox; John- eagle. Evangelist portrait: a painting of an Evangelist introducing his Gospel. 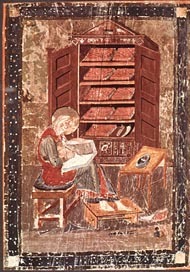 This convention was derived from the tradition of introducing Ancient manuscripts with author portraits. 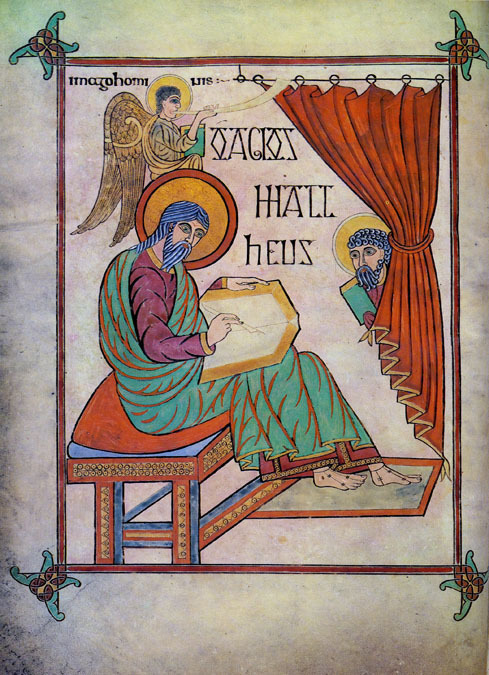 Carpet page: a decorative page facing the opening of each Gospel in an insular Gospel book. The following are the instructions given by Pope Gregory the Great to Abbot Melitus on the missionary activities in England. "...when by God's help you reach our most reverend brother, Bishop Augustine, we wish to inform him that we have been giving careful thought to the affairs of the English, and have come to the conclusion that the temples of the idols among that people should on no account be destroyed. The idols are to be destroyed, but the temples themselves are to be aspersed with holy water, altars set up in them, and relics deposited there. For if these temples are well-built, they must be purified from the worship of demons and dedicated to the service of the true God. In this way, we hope that the people, seeing that their temples are not destroyed, may abandon their error and, flocking more readily to their accustomed resorts, may come to know and adore the true God." John I, 14: And the Word was made flesh, and dwelt among us, (and we saw his glory, the glory as it were of the only begotten of the Father,) full of grace and truth. 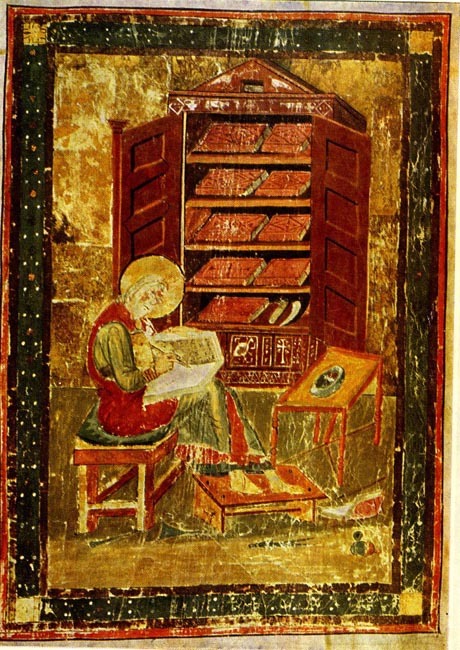 "I published three books [on Genesis] from the sayings of the holy Fathers concerning the letter and the spirit... For the word came into the world by Mary, clad in flesh; and seeing was not understanding; all saw flesh; knowledge of the divinity was given to a chosen few. So when the Word was shown to men through the lawgiver and the prophets, it was not shown them without suitable vesture. There it is covered by the veil of flesh, here of the letter. The letter appears as flesh; but the spiritual sense within is known as divinity. This what we find in studying Leviticus... Blessed are the eyes which see divine spirit through the letter's veil." 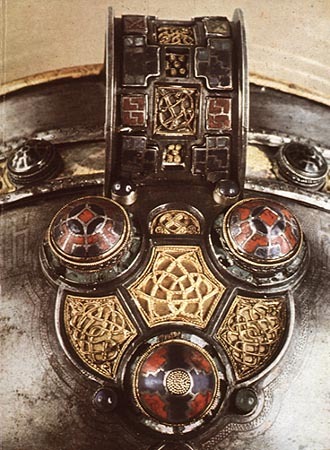 Purse Lid from Sutton Hoo, 7th c. Symbol of St. Matthew from the Book of Durrow, 2nd half of the 7th c.
Discuss the sources for the decoration of the Book of Durrow page indicated by this comparison. What does this comparison indicate about the way Christianity interacted with the cultural and artistic traditions it met in the North. 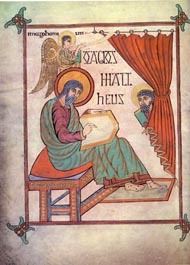 Ezra from the Codex Amiatinus, early 8th c. St. Matthew, from the Lindisfarne Gospels, late 7th c.
Clearly both of these illustrations are based on the same model- probably a sixth century Italian manuscript. Discuss how the artists have reacted to the model in different ways. Note how in one case the artist has tried to reproduce the original as accurately as possible and in the other the artist has adapted the work to his own stylistic idiom. Pay attention to aspects such as the different approaches to space and color found in the two.